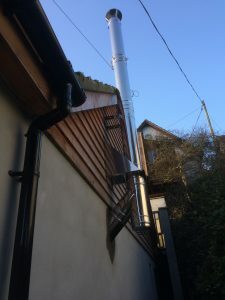 This flue passes through the external wall and then runs up the side of your house. 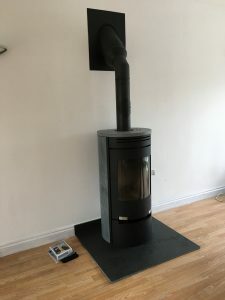 The angle of the twin wall flue as it passes through the external wall will be at a 450 angle. There will be a wall sleeve encompassing the flue as it passes through the wall cavity. 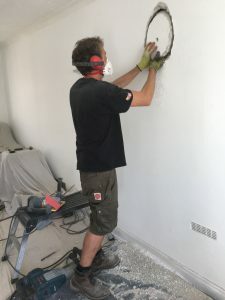 A cover plate will be used internally to ensure a neat finish. Specialised supports and wall brackets will be used at intervals ensuring the flue is well supported as it passes up the side of your house. 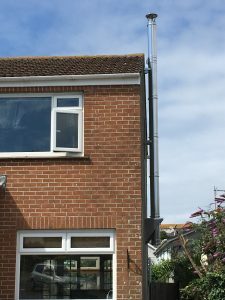 The height of the flue above the gutter/roof will be determined by building regulations. Measurements will be made to ensure the hole we create is accurate to the nearest centimetre. 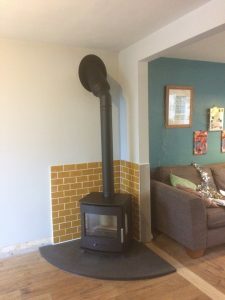 The distance of the stove against the wall or its heat shield (required if the stove is located against a “combustible” wall such as plasterboard – including pink board) is taken into account. 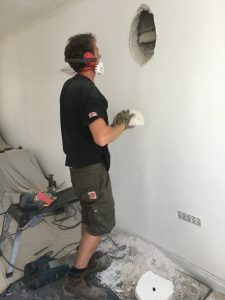 The hole through the wall will be carefully drilled out creating an opening that is oval shaped and that will allow the twin wall flue to pass through on a 45° angle. 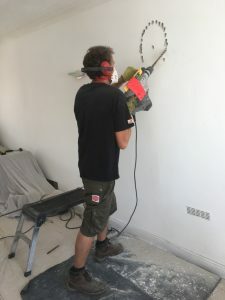 Minimising the effects of dust-fall will be taken in consideration and implemented. The hearth will be fixed and the stove will be situated on it directly in the middle (unless otherwise stated). 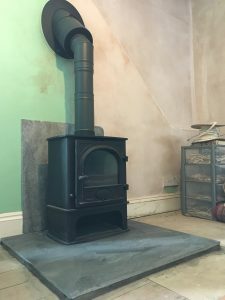 Vitreous enamel flue pipe or twin wall flue pipe will start from the top of the stove (this creates a better draw), and then a 450 bend will be used to direct the flue through the wall. A wall sleeve, insulation and various methods and materials will be used to create a watertight seal that does not leak into your house. 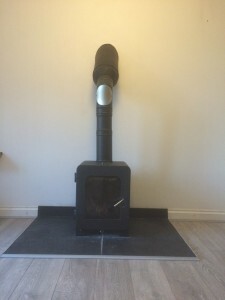 Internally a finishing plate (typically oval shaped) will be attached to the wall surrounding the flue to complete the internal aspect of the installation. 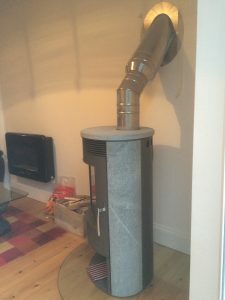 Externally a pair of triangular arms will support a base plate that will take the weight of the entire flue system. Fixings to the support arms are normally achieved with thunderbolts. 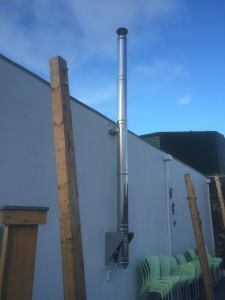 The flue will be perfectly level and at the right distance from the wall to bypass any combustible objects (such as gutters) without having to use any unnecessary bends and thus compromise the draw. 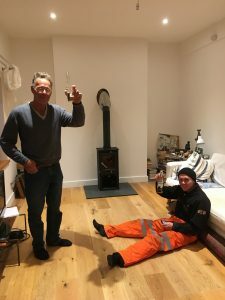 The simple rule being that the taller and straighter the flue, the better the draw. Why include expensive bends that compromise the draw if they are not required? Ample support will be given to the flue along its journey upwards. Let’s not forget that we live by the coast and are regularly subjected to Mother Nature and her windy ways! 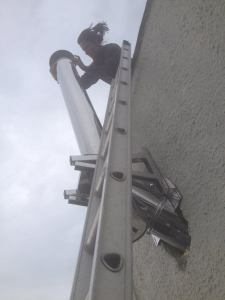 We like to lock that flue in place and ensure it stays locked down.